This course is suitable for anyone who wants to gain an in-depth understanding of Lean, including those who are new to the concept of Lean but who are ambitious about learning and applying the Lean principles and change management within their organization. There are no pre-requisites for learners wishing to complete the Lean Foundation and Management Overview course. If successful, you will be awarded a Lean Foundation (level 1) Certificate of completion. Why Study Lean Foundation with 4PA? Lean’s primary purpose is to reduce operational costs by eliminating waste and increasing customer satisfaction. Lean methodology focuses on continuous business improvement within an organization by encouraging Lean practitioners to motivate their workforce in order to achieve. After taking this course you will have developed the skills to solve problems using the Lean Six Sigma project structure. Lean can be applied to any organization and business process, so you will benefit from being able to apply Lean in your organization’s industry sector. Why Adopt Lean for Your Organization? Lean improves business processes in terms of human error, effort, time and finance. Business process improvement will help organizations to optimize their costs by creating products and services with fewer defects in comparison to a traditional business approach. Therefore, lean-thinking organizations are able to provide more value to their customers without compromising on quality. They will be able to respond to changing trends and customer demands, offering a wide variety of high quality products at a fraction of the cost and time required by traditional, non-lean thinking organizations. This eLearning course provides you with all the training and materials that you will need to prepare for the Lean Foundation assessment. This course is ideal for professionals who want a comprehensive introduction to Lean methodology, need to know about Lean in the work place, and would like to start a career in Lean Management. On completing the course, participants will be able to confidently apply Lean immediately in an industry sector and will be able to apply the knowledge and skills acquired within an organization. The course includes three multiple-choice tests and on successful completion, participants will be awarded a Lean Foundation Certificate. Module 1 will introduce you to the ways a Lean process can be implemented within an organizational environment. The module will also touch upon on stakeholder management and communication. You will learn about the principles of Lean, the importance of Value and Value Stream Mapping. Module 2 will take you through the Lean process flow and the 5S Approach. After completing the module, you will have an appreciation of the visual workspace application. You will understand the concept of process risk analysis and how to work with certain standard diagrams. You will also be learn how to evaluate and analyze risk. In Module 3 you will learn how to manage the Lean process and the changes that will occur within the organization as a result of it. You will also be prepared to deal with changes during the Lean implementation process. Additionally, this module will teach you about the Lean project planning and management process and the methods for problem solving and improving the methodology. Finally, you will find learn how to plan and deploy a Lean implementation within your organization. This module contains an interesting exercise to help you consolidate you knowledge of the learning outcomes in the previous modules. Ready to go through the Lean Foundation & Management Overview (level 1) assessment? On this page, you will find everything you need to know! On successful completion of the assessment, participants will be able to confidently apply Lean immediately in chosen industry sectors and be able to apply the knowledge and skills you acquired straight within your organization. There are no pre-requisites for learners wishing to complete this Lean Foundation course and if successful, you will be awarded a Lean Foundation Certificate of completion from 4PA e-Learning. Our Lean Foundation & Management Overview eLearning course is assessed by three multiple-choice tests and the completion of an interactive exercise, based on the learning outcomes from the core modules in the course. 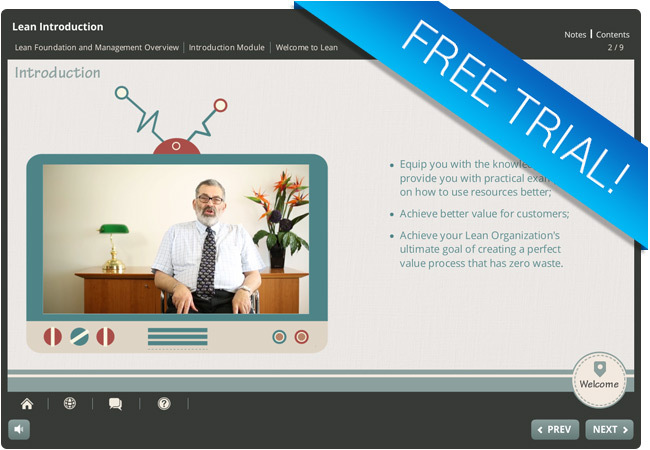 Why not try out a free trial module from our Lean Foundation & Management Overview (level 1) eLearning course! In this Lean Foundation trial module, you will learn how to achieve your Lean Organization’s ultimate goal of creating a perfect value process that has zero waste via a mixture of interactive and audio techniques to enhance the learning experience. Like our full Lean Foundation & Management Overview e-learning course, you can access this free trial module from any device whether you are at home, at work, or on the move! Upon successful completion of this course, you will be awarded a Lean Foundation (level 1) Certificate of completion.